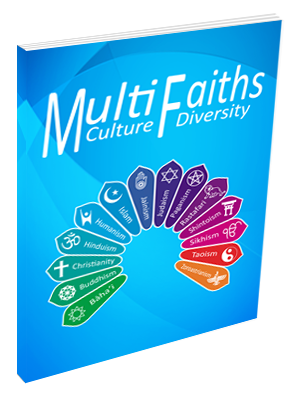 Multifaiths.com is dedicated to embedding equality and diversity issues into every aspect of the public life. The lives of millions have been improved by the scientific, industrial, and economic development that drove the political separation of faith and state. Around the world, religious fundamentalists from different faith traditions clash with one another yet are often united in their opposition to a secular modernity that elevates reason above faith. Some fundamentalists refuse to modify their religious views to accommodate evolutionary theory or stem cell research. Meanwhile, certain postmodern sceptics undermine the foundations of dogmatic religion and scientific rationality alike. Current conflicts over faith, reason, and scepticism are only the latest variants of debates that have occurred for centuries. I also believe we should encourage meaningful and active participation in society, by shifting the balance of power away from the state and towards the people. That way, common purpose can be formed as people come together and work together in their neighbourhoods. Faith & Public Policy, the alternate between a theoretical focus, a policy focus and a political focus. The theoretical- focused session draws on philosophers, theologians and social scientists to present critical responses to the role of faith in relation to politics and society. Diversity, Training and Education. We are dedicated to helping you learn how to lead lives of purpose and meaning. The workshop on faith and vocation helps these men and women understand their own unique vocations in education and also become better advisors and mentors to their fellow students. Multi Faiths Navigators - This year we are giving talks and presentation, in areas of particular interest to services users and provider of education, chaplaincy, health, equality, local government, the police, fire and rescue, local inter faith groups, for more details call us Tel: 0845 430 9114. - Mr. M. Hirani or contact through our website. Cultural Diversity - The mosaic of individuals and groups with varying backgrounds, experiences, styles, perceptions, values and beliefs.Differences in race, ethnicity, language, nationality, or religion among various groups within a community, organization, or nation. Faith groups, social enterprises and the third sector have considerable knowledge and practical experience to act as local patient champions in response to the Public Health and well being needs of vulnerable and marginalised people within neighbourhoods. Religion or belief influence many aspects of people’s lives including practices and beliefs around birth, death, marriage, health, food, duty, dress code and many other areas. It is important for employers and service providers be aware of these and to be able to appropriately respond when someone’s beliefs impacts on their ability to carry out their work or deliver a service. * How do we see the task of Community and Nation Building from the perspective of our own religious tradition? * Visiting each other’s prayer and worship services. * What in our traditions enables us to enter into dialogue with people of other faiths? * What are our teachings and practices about fasting? 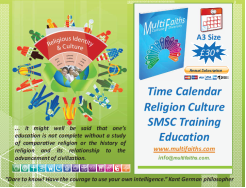 * What kind of world vision, does our faith tradition suggest? * What does our scriptures teach on Family Values? * Introducing a significant personality from our faith tradition of the past. * Explaining the meaning of our symbols and rituals to one another. * The place of women in our Scriptures, Tradition and in practice today. * Death and the ceremonies connected with death. Ofsted have placed equalities and human rights at the heart of their approach to regulation and inspection in England. The inspection framework for schools includes specific questions about: • how schools are meeting their equalities duties, whether there are different outcomes for different groups of children, how schools are dealing with bullying. 1) For individuals: For Government Departments, Public Bodies, and Commercial Sector. For Universities, Colleges, Local Authorities, For Voluntary Organizations, Trade Unions, Public Schools. The use of curricula and teaching and learning materials that: build upon the diverse systems of knowledge and experiences of the learners; incorporate their histories, knowledge and technologies, value systems and further social, economic and cultural aspirations; introduce the learners to an understanding and an appreciation of their cultural heritage; aim at developing respect for the learners’ cultural identity, language and values; make use of local resources. The development of teaching methods that: are culturally appropriate, for example through the integration of traditional pedagogies and the use of traditional forms of media,such as story-telling, drama, poetry and song are based on practical, participatory and contextualized learning techniques that include: activities resulting from collaboration with cultural institutions; study trips and visits to sites and monuments; and productive activities that are linked to the community’s social, cultural and economic needs. GUIDELINES ON INTERCULTURAL EDUCATION imparting the ability to adapt educational contents, methods and materials to the needs of groups whose cultures diverge from the majority group; facilitating the application of diversity as a tool in the classroom to benefit the learner. The promotion of learning environments that are respectful of cultural diversity through, for example, awareness of dietary requirements; respect for dress codes; and the designation of areas for prayer or meditation. Decentralization for the development of contents and methods to take into account cultural and institutional differences from one region to another; and the participation of learners, parents and other community members, teachers and administrators from different cultural backgrounds in school management, supervision and control, decision-making, planning and the implementation of education programmes, and the development of curricula and learning and teaching materials. Intercultural Education provides every learner with the cultural knowledge, attitudes and skills necessary to achieve active and full participation in society. The implementation of special measures to address contexts where historical backlogs limit the ability of learners and teachers to participate as equals with everyone else in society. Appropriate teaching methods that: promote the learners’ active participation in the education process; integrate formal and non-formal, traditional and modern teaching methods; promote an active learning environment, for example through the conduct of concrete projects, in order to demystify book-based knowledge and to give people a sense of confidence and to acquire cultural skills, such as the ability to communicate or to cooperate with others. GUIDELINES ON INTERCULTURAL EDUCATION A clear definition and accurate assessment of learning outcomes, including knowledge, skills, attitudes and values. Appropriate language teaching: every learner should acquire the capacity to communicate, express himself or herself, listen and engage in dialogue in his or her mother tongue, the official or national language(s) of his or her country and in one or more foreign languages. The skills to incorporate pupils from non-dominant cultures into the learning process; the skills to take into account the heterogeneity of the learners; a command of methods and techniques of observation, listening and intercultural communication; of more than one working language where appropriate and of some notions of anthropological analysis; a command of appropriate assessment procedures and open mindedness to continual assessment, evaluation and redefi nition of methods. Intercultural Education provides all learners with cultural knowledge, attitudes and skills that enable them to contribute to respect, understanding and solidarity among individuals, ethnic, social, cultural and religious groups and nations. Awareness of the increasing global interdependence between peoples and nations; awareness not only of rights but also of duties incumbent upon individuals, social groups and nations toward each other; understanding of the necessity for international solidarity and cooperation; awareness of one’s own cultural values that underlie the interpretation of situations and problems as well as the ability to reflect on and review information enriched by the knowledge of different cultural perspectives; respect for differing patterns of thinking. Adequate teaching and learning methods that: treat the heritages, experience, and contributions of different ethnic groups with comparable dignity, integrity, and signifi cance; provide for learning in an egalitarian context; correspond to the values taught; provide for interdisciplinary projects. GUIDELINES ON INTERCULTURAL EDUCATION The acquisition of skills to communicate and co-operate beyond cultural barriers and to share and co-operate with others through: direct contacts and regular exchanges between pupils, students, teachers and other educators in different countries or cultural environments; the implementation of joint projects between establishments and institutions from different countries, with a view to solving common problems;the setting up of international networks of pupils, students and researchers working towards the same objectives; the acquisition of abilities for conflict resolution and mediation. The teaching and learning of foreign languages and the strengthening of the cultural component in language teaching. Knowledge of the history of civilization and anthropology so as to facilitate better understanding and the ability to convey the idea of the plural, dynamic, relative and complementary nature of cultures; the social and political competencies and the open-mindedness conducive to the permanent promotion of active social participation in school management and in the design, implementation and evaluation of school projects and programmes; development of an ability to make the best use of visits to museums and other institutions for effective intercultural teaching; open-mindedness and an ability to interest the student in learning about and understanding others; the acquisition of techniques of observation, sympathetic listening and intercultural communication.